What is your digital marketing and SEO plan for 2018? William Hogsett, who has done digital strategy for some the world’s best brands, including The PGA of America, Revlon and TTI, Inc. shares a few tips on attacking the new year with a plan in hand. 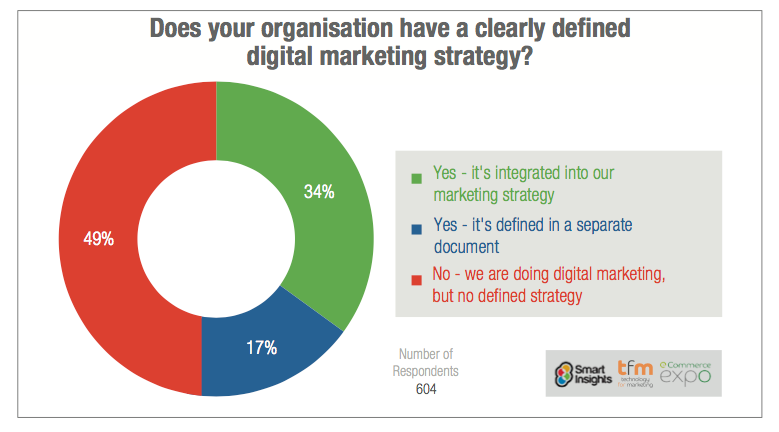 After reading a recent research study by SmartInsights that reported only 51% of businesses have a digital marketing plan in place I decided to do my small part to help improve that number. Like everything else in life, success takes planning. No matter what industry you are in, your customers are online all the time. Almost every metric you measure in order to track your company’s success can be impacted with a good digital marketing plan. We use the R.A.C.E. digital marketing model in our client planning but you can use whichever method and tools you have at your disposal. R.A.C.E. is an acronym for Reach, Act, Convert, Engage. R.A.C.E. may be the most widely used methodology for internet marketing professionals. For the purpose of this article I am going to stay methodology neutral and focus on high level elements that you need know to start your digital marketing plan. Before we begin I assume you have know your Unique Selling Proposition (USP). If not, please take out a piece of paper (people think better when they write vs. type) and write down all the reasons people buy from you instead of your competitors. Use these ‘reasons’ to craft your USP. Professional Tip: Having the lowest price is a losing USP. In marketing, using a customer persona has become the hot, trendy term and process for knowing your customer. It works by segmenting your customers into groups and then creating an avatar for a single customer from each group. The avatars are very detailed and the objective is to get to know the person the avatar represents. Name your avatar, and ask these questions; how old is she, what does she do for a living, how much money does she make, where does she have lunch, what type of car does she drive, does she drink beer or wine (red or white), what magazines does she read, iPhone or Android, what music does she listen to, how many kids, married, what is her favorite color, how does she spend her disposable income, does she smoke, and so on..
You get the idea. Now, for this avatar, for this customer group, how do you convince her to frequent your business? Where do we reach her online and off? What messages is she open to and what messages will drive her away? If you did it right you should know how to reach and convince this customer type to do business with you. Now repeat the process for each of your customer groups. Your digital goals should always be tied back to you overall goals for the business. Then the question becomes what tools and digital assets do you need to achieve your objectives. For instance, a restaurant wants to increase overall revenue by 10%. The website and digital assets need to help the company achieve that goal. We have to identify the areas to measure and improve. Let’s attack the simplest of your digital assets to measure, your website. We can start with the basics like total visitors to the website, conversion ratio, (which is the ratio visitors to reservations) what percent of the visits come from mobile and what is the conversion ratio for mobile users. Armed with total visits and conversion ratio spit across the user devices we can now put in place a system to increase reservations from the web. We can increase the number of visitors to the website, we can increase the conversion ratio or we can increase both. Increasing visits is typically tied to one or all of the following Earned Media, Paid Media, Owned Media. Earned Media refers to things you do to get noticed that you don’t directly pay the medium on which you get noticed: Getting more traffic to your website via earned media would includes SEO, Blogger Outreach, Social Posting, Social Interaction, and earning your way onto “Best of List”. From our experience all of these channels work to drive traffic. SEO has the longest lasting impact. Blogger outreach kills two birds with one stone because links from the blogs you earn help with your long term SEO. Paid Media refers to items you pay for to drive traffic and mentions. Examples of paid media would include print advertisements, postcards, Google AdWords, Facebook Ads and buying your way on to “Best of List”. Paid media delivers the quickest results but will typically have no long term benefit and is only good as long as you are paying. Effectively using paid media to driver traffic requires a detailed understanding of your market and how you drive ROI. Some small businesses fall into the trap of relying on paid media as their only source of traffic. This is not only expensive it is also a poor allocation of your marketing budget. Having a proper mix o f earner media and paid media is essential to your long term success. Owned Media, is the media you control. For most business that would include their website and to an extent their business social profiles. If you have done a good job with your marketing strategy you may own other influential websites or papers. Seota once owned an online newspaper to promote our clients. That asset was sold. So, now you have a detailed picture of your customer (avatar), analytics about your websites performance as it relates to your business, a high level knowledge of the tools and a copy of your business objectives for the year it is time to put together a plan. Improving Conversion Ratio is a topic for another blog. ← Are Brand Signals important to your internet marketing efforts?